We touched on Japanese mythology awhile back, skimming over the several ways in which crows and ravens have spiralled their way into Japanese art, culture, and religion throughout the centuries. 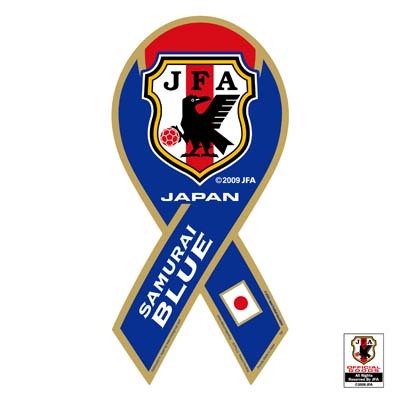 With World Cup fever sweeping the land, the “Samurai Blue” color of Japan’s national soccer team can be seen everywhere. Equally familiar is the team’s black crow emblem. Few people, however, look closely enough at this bird to note that it actually has not two, but three legs. Even fewer people realize that this emblem is directly connected to one of the most pivotal episodes in Japan’s classic mythology. ‘When Amaterasu the Sun Goddess wished to establish a kingdom here on earth, she equipped her grandson with rice seeds and various imperial paraphernalia and sent him down to the island of Kyushu. A few generations later, however, the heir to the throne, Iwarehiko, decided that the land could be better governed from a more central location, and set out on a journey to the east. After sailing through the Seto Inland Sea, the imperial expedition landed on the shores of what is now Osaka. From here they planned to push eastward over the Ikoma and Kongo mountains into the fertile Nara Basin. Before they could even gain a foothold, however, they were turned away by fierce resistance from the local clans. Back in their boats they sailed south then eastward, rounding the Kii Peninsula and landing somewhere near modern day Nachi-Katsuura in Wakayama Prefecture. From here the route to the Nara Basin lay to the north, passing over a long stretch of steep, densely forested mountains. Once in the forest the expedition quickly lost their way. Furthermore, enthralled in a powerful spell woven by a local bear sorcerer, all the men fell into a deep stupor. But Amaterasu the Sun Goddess was not ready to abandon her descendent and protege. From the High Plain of Heaven she had a magical seven-pronged sword sent down and presented to Ihare. With sword in hand, the sorcerer’s spell immediately dissolved. Next, Amaterasu dispatched her own familiar spirit, a giant three-legged solar crow called the Yata-garasu, which guided the expedition along the difficult mountain path all the way to Yoshino at the southern edge of the Nara Basin. Arriving in Nara, Iwarehiko subdued all the rebellious clans and established the kingdom of Yamato. In history books he is better known as Jimmu, the first in Japan’s long line of imperial emperors that still continues today. Without the Yata-garasu there might not even have been a Japan, never mind a national soccer team! The concept of a giant crow associated with the sun is thought to have originated in China, and may have first developed as an explanation for sunspots. Also, crows were long believed to serve the local kami deities in the Kii region. Images of a three-legged crow inside a sun circle have been found on the wall of an ancient barrow grave on the Korean Peninsula, and even today can be seen on the banner of the Kumano-Hongu shrine, the center of the Kii Peninsula’s sacred lands and pilgrimage paths. Here in Japan, ravensÂ are occasionally spotted in eastern Hokkaido, but only two species, the jungle crow and carrion crow , are common and widely distributed. These two species can be told apart by the thickness of their bill. In fact, the common Japanese names, hashi-buto-garasu for the jungle crow and hashi-boso-garasu for the carrion crow, respectively mean “thick-billed crow” and “thin-billed crow.” Also, the jungle crow is slightly larger and heavier built, and sports a high protruding forehead. It is a bit difficult to determining which species the yata-garasu is originally derived from. Ecologically, the jungle crow prefers dense forests and coastlines; while the carrion likes meadows and open farmland. The rocky coasts and heavily forested mountains of the Kii Peninsula would have provided ideal jungle crow habitat, but the extensive rice paddies of the Nara Basin would have favored carrion crows. The shape of the bill and forehead on the traditional images are inconclusive, but the current emblem used by the national soccer team is clearly that of a jungle crow. The jungle crow’s thick, sharply-hooked bill rivals that of an eagle. Such a powerful bill is ideal for ripping open a fish or deer carcass. Ironically, it is also perfect for slicing open a plastic garbage bag. As a result, jungle crows have proliferated in urban areas. Intelligent and adaptive, they also prey heavily on urban birds such as doves, pigeons, starlings and sparrows. I have seen these fearsome hunters swallow an unfortunate sparrow fledgling in a single gulp. During the spring and summer nesting season, each mated pair establishes and defends their own feeding territory. Jungle crows are famous for stealing metal clothes hangers from backyards and verandahs to weave into their huge nests. They seem to have a special fetish for blue items. The parents aggressively defend their nest and brood, and in some urban parks and gardens even dive-bomb people that stray too close. The Yata-garasu on the national soccer team emblem is said to symbolize power and quickness. The symbol was adopted in 1931, in honor of Kakunosuke Nakamura (1878-1906), considered to be the founding father of soccer here in Japan. Nakamura (no relation, I assume, to Japan’s ace Shunsuke Nakamura) was a native of the southern Kii Peninsula.